Thanks to my lovely critique partner Gayleen, I have several books by Oklahoma authors to read and review. Of course, I’m taking forever on it, but I really have the best intentions of reading the books and getting them on here. Anyway, the girls made a bet. Since the sister understandably doesn’t want to be peed on, she tells Pia Scarlet that if she doesn’t wet the bed for a whole week, she’ll switch with her. The book is very cute as it goes through Pia Scarlet’s seven nights of attempted dryness. 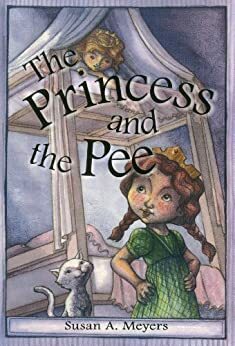 The illustrations (by Manelle Oliphant) are lovely and add to the story.The book is fun, never preachy, and has been enjoyed by my six year old. Susan is also a member of the Oklahoma chapter of SCBWI, and I’ve gotten the pleasure of starting to get to know her. I’m definitely looking forward to seeing more or her and enjoying the rest of her books. She’s a good writer and nice person too! Thank you for a wonderful review! I’m glad you enjoyed my book (pee and all!). Susan…thanks for stopping by my blog! I’ll admit, I use the word pee too…but it’s still a little shocking to see it in print, ha ha! Seriously, though, it was a such a cute book and a pleasure to read!